Come on spring! If I decorate for spring will it show up for good. We are being teased with flip-flop weather this week. Next week, we could be back in Uggs! 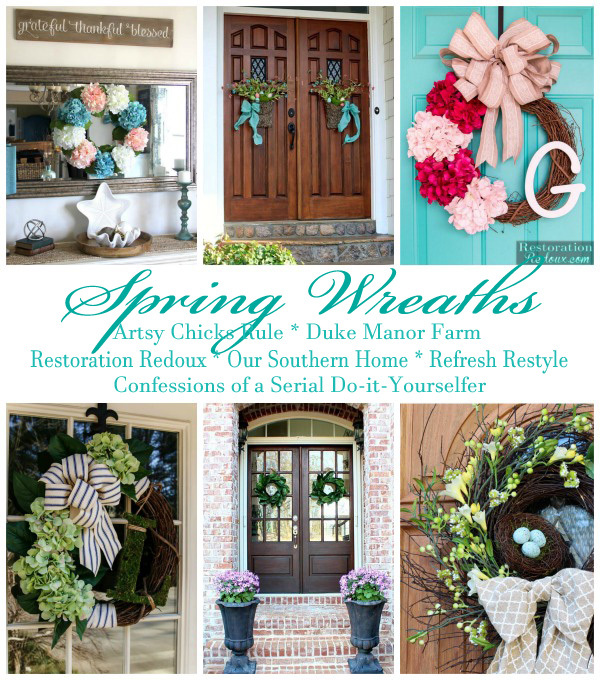 Maybe if we show you our Spring Wreaths, the lovely temps will stick around for good! 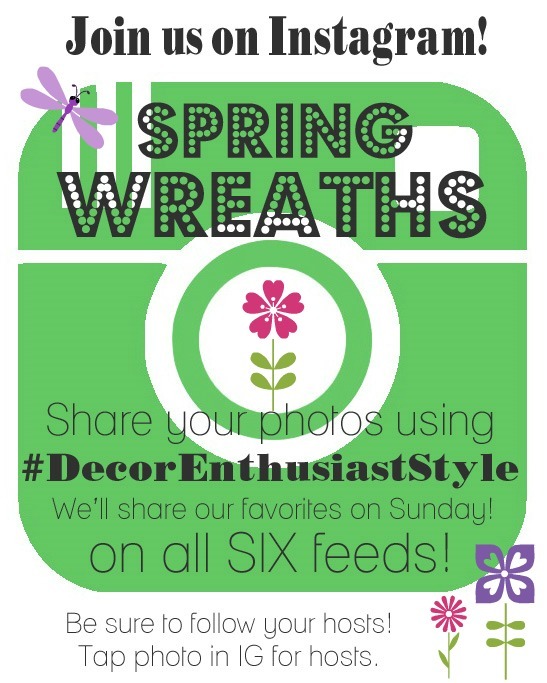 Today along with the other gals on the Decor Enthusiast Style team, we are sharing our spring wreaths. I'm sharing my oh, so easy……. I started off-center at the bottom of the wreath and wrapped the ribbon a few times around the wreath securing with hot glue on the back side. Cut the stems with just a few inches left. Then I just work them into the grapevine from the top. Add a ribbon and secure with wire to the wreath. Cut off all of the leaves. Wire one of the floral picks to each leaf and just tuck in and around the hydrangea. The letter I had already added the moss to a couple of years ago. You can see how I did that HERE. You could simply paint it or even decoupage scrapbook paper to it. I secured it to the wreath with twine. To the right of the bow, I added the 4th hydrangea. I then finished it off with a little left over ribbon wrapped around the wreath like on the bottom. The side door had been wreath-less since Christmas. It's nice to see it looking a little bit more welcoming once again. Don't you just love that blue wired ribbon from Walmart! I really need to go grab up some more. It was on the same aisle with the hydrangea. You don't have to spend a fortune on a wreath. I already had the wreath form and other supplies. The 4 hydrangea stems were only $3 each and I believe the spool of ribbon was $6.99! This wreath will definitely be on this door I'm sure until fall! I love the FARMHOUSE feel the wreath gives this area. Be sure to PIN for later and to share with your friends! Thanks bunches! Here's what my talented Décor Enthusiast girls came up with for this month's Spring Wreaths theme. Visit them at the links below! I made this wreath this past weekend. It is, by far, my favorite wreath I’ve ever made! Thank you so much! It’s my favorite wreath ever! I need to go buy some fresh ribbon to replace mine. It’s a little shady in that spot and the ribbon has molded a little. Thanks goodness Walmart still carries it. Happy Spring! Christy this wreath is spectacular! I have pinned it for inspiration. Thanks so much sweet, Marie! I hope you are having a wonderful spring!!! I love the hydrangeas but that ribbon is awesome too! So pretty!